Rollover Protection Structures (ROPS) are 99% effective in preventing rollover deaths and serious injuries. The New Hampshire ROPS Rebate Program pays up to 70% (approximately $865 in savings) off the cost of purchasing and installing rollbars. Farming remains one of the most dangerous occupations in America, and tractors are the number one cause of deaths in farming. Most of those tractor-related fatalities involve side or rear overturns. 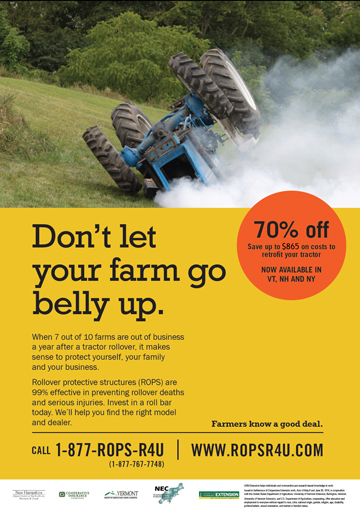 The deaths and permanently disabling injuries resulting from tractors rolling over are preventable! While newer model tractors are factory-equipped with rollover protection systems (ROPS), many older-model tractors that lack ROPS are still in use on farms. Invest in a roll bar today! Visit ropsr4u.com for more information.